A brilliant combination of the most famous and recognized things in the biz; 1) Op. Enduring Freedom Khukuri 2) Raw or Black version and 3) Buffalo Horn finger grip..
Black Op. Enduring Freedom is the later version of the famous “Operation Enduring Freedom Khukuri (Afghanistan)” that was released in late 2008 by KHHI. Here the standard template of the Enduring Freedom is slightly modified by using different material and finishing. 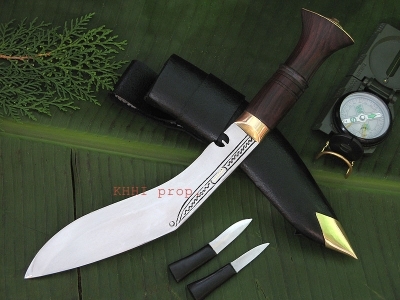 BOEF is actually a brilliant combination of the most famous and recognized things in the business of khukuri. Buffalo Horn finger grip handle. KHHI’s superb effort into creating a kukri knife in the famous Enduring blade with black bladed version fitted with Enduring type horn handle finger groove edge is truly a work of class that would deliver nothing but the highest level of result, satisfaction and confidence. It is dedicated and built for all Peace Keeping Force around the globe to help maintain law and order, keep peace and security and save and serve humanity from his adversary and his ideology. Blade:: Shape, size and design like that of the famous “Operation Enduring Freedom Khukuri” however the traditional notch is replaced by pointed nozzle (see photo) to give a modern and appealing look. Here the famous Black (Raw) finishing is adopted (hence the name) for the blade for strength, durability and prominent look. The edge (bevel) is however whitened or finished (unpolished) to perform better and give extra sharpness to the edge. 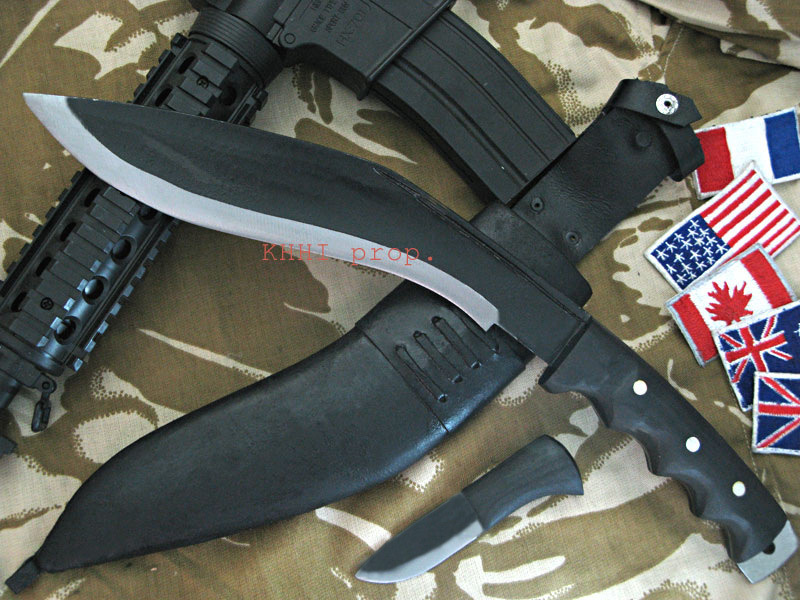 Handle:: The basic template of “Operation Enduring Freedom Khukuri” but improved by the “Knuckle Panel” at the front edge for easier and better grip. The erected guard protects the user’s hand within handle area where as the finger grips (curvature) ensures a well balanced, comfortable and efficient handling at all times. Similarly, a lanyard facility in the extended tang also comes as an advantage to keep the khukuri intact in the user’s hand even in very sweaty and slippery conditions. Scabbard:: Bop.EF has a regular sheath (buffalo leather) having a leather lanyard loop and houses a small but very useful 2.5 inches bladed Back Up knife as shown in the photo. This small utility knife comes in equally handy for small but important cutting activities. Its very handy and effective size fitted with a comfortable handle makes minor cutting tasks easier than the mother blade itself. Similarly, Bop.EF belt holder or Frog has a fasten-up strap button to keep the blade attached to the sheath (loop) at all times, while even in heavy motion. This little but very useful feature gives the much needed clutch that the carriage becomes so much easy and trouble free. I really like it thank you! Great work. Please thank the craftsman. I will order another one. I need a week to show it to a friend who might want one also. I will write you a week from today.